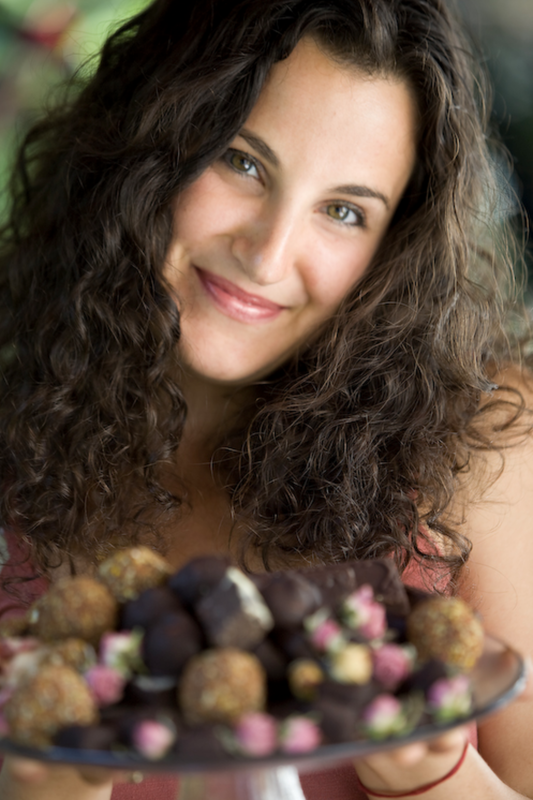 Aradhana's obsession with raw chocolate began in Topanga, California in early 2007. 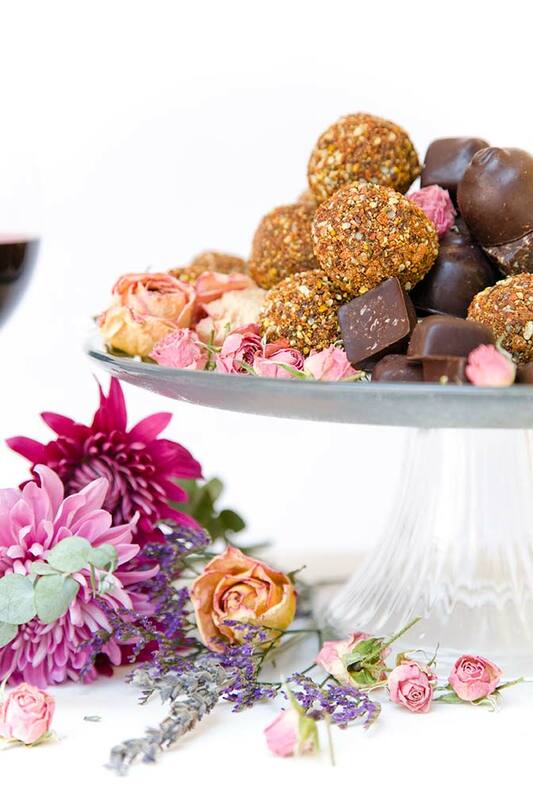 Silvermoon Chocolate was born and nurtured during the height of the Los Angeles raw food movement, growing up alongside its sibling, our husband-wife musical project, I,Star. She began making treats and selling them at the band's music events, where people went nuts for Aradhana's creations. Our company was the result of adamant demands from our community! 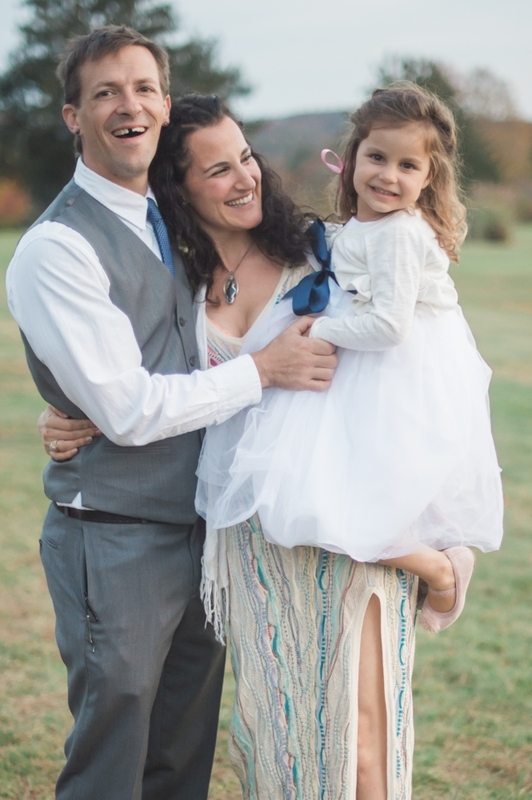 After five years of dazzling taste buds on the West Coast, we were called to relocate to our current home in Asheville, North Carolina, to pursue our musical and chocolate dreams and start a family. Landing, however, was wrought with perils in our personal lives, causing us to lose nearly everything we had worked so hard for. The setbacks we faced in our first year have taken years to rebuild and heal from, yet somehow during that time, we were still able to establish ourselves as a strong local brand in our community. Our company has been slowly growing, and we've built a significant grassroots network of support in Asheville & the local surrounding areas. Our products are sold everywhere from Whole Foods Markets to the largest local farmers' market, coffee and tea shops, boutique hotels and natural foods cooperatives. We've taken our booth on tour with our band to festivals up and down the east coast and into the midwest, introducing our brand to awestruck mouths with the promise of future local availability! We are currently in an expansion phase, working hard to get our products to a health food store or coffee shop near you!!! 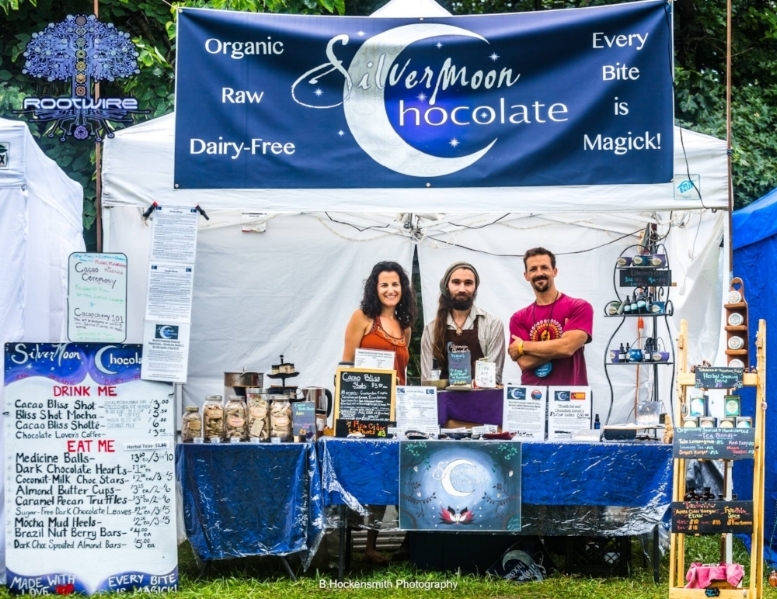 Photo of our team holding down the Silvermoon booth at Rootwire Festival in Ohio!! Truth-I and Aradhana rocking with their band, I,Star at Kinnection Campout! Family shot!! Radhi and Truth-I with their daughter Perseia. Cacao has been used for centuries and was considered sacred and precious to many ancient cultures, including the Mayans and Aztecs. It was sometimes used as an offering to their gods, and therefore, the scientific name later became Theobroma, which literally means, “Food of the Gods." The small seeds from the cacao tree, native to the deep tropical regions of the Americas, are the key ingredient in our beloved chocolate, and have brought such decadence and enjoyment to our lives. We are blessed to be able to experience the pleasures of chocolate on a deeper level because it is now available in it's raw, unroasted form, thereby preserving more of the nutrients, fats, enzymes, and pleasure enhancing properties of raw cacao! Contains more Magnesium than any other food—which is the number 1 mineral deficiency in the west, and ironically, the most powerful stress-relieving mineral. Magnesium also relaxes the muscles and builds strong bones and teeth.